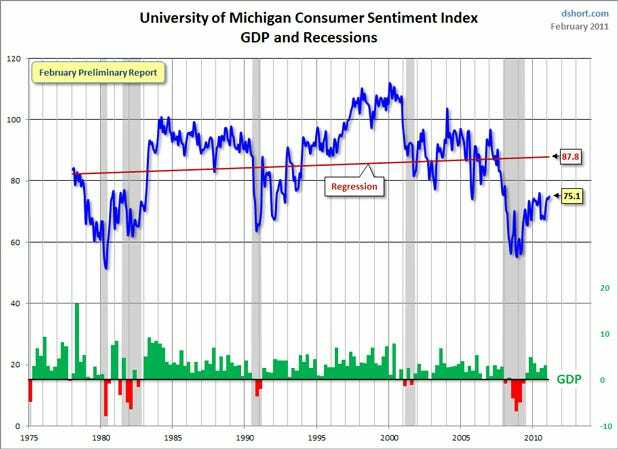 The University of Michigan Consumer Sentiment Index preliminary report for February came in at 75.1, an improvement from last month’s interim 72.7 and a fractional improvement over the 74.5 in the final report for January. The February number was slightly below the Briefing.com consensus expectation of 75.5. See the chart below for a long-term perspective on this widely watched index. Because the sentiment index has trended upward since its inception in 1978, I’ve added a linear regression to help understand the pattern of reversion to the trend. I’ve also highlighted recessions and included real GDP to help evaluate the Michigan Consumer Sentiment Index as an indicator of the broader economy. 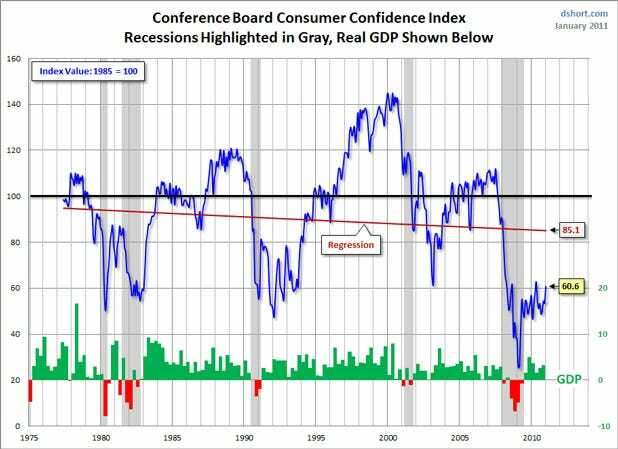 To put today’s report into the larger historical context since its beginning in 1978, consumer sentiment is about 13% below the average reading (arithmetic mean), 12% below the geometric mean, and 14% below the regression line on the chart above. The current index level is at the 24nd percentile of the 398 monthly data points in this series. 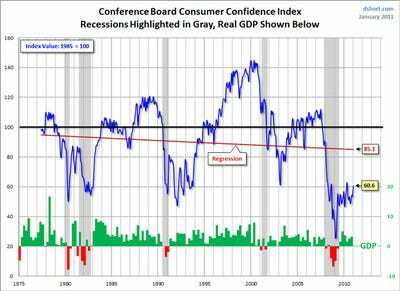 For the sake of comparison here is a chart of the Conference Board’s Consumer Confidence Index (monthly update here). The Conference Board Index is the more volatile of the two, but the general pattern and trend are remarkably similar to the Michigan Index. 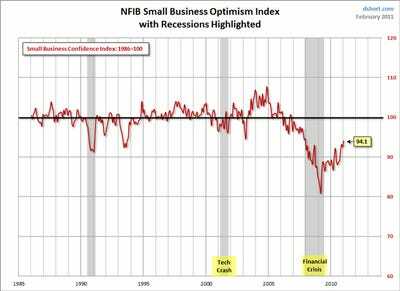 Consumer and small business sentiment remains at or near levels associated with the bottoms of other recent recessions. For consumers and small businesses this really is The Great Recession.